Following is the script for this episode (there are slight changes in the audio version). Hello! Welcome to the fourth episode of Spark On With Neelu. I am your host Neelu and today's is a solo episode. I was writing a blog post about my One Little Word for 2017 and since it was turning out to be rather long, I thought I will record an episode to make it easier for those of you who prefer to listen. One Little Word is a memory keeping, documenting project started by Ali Edwards. 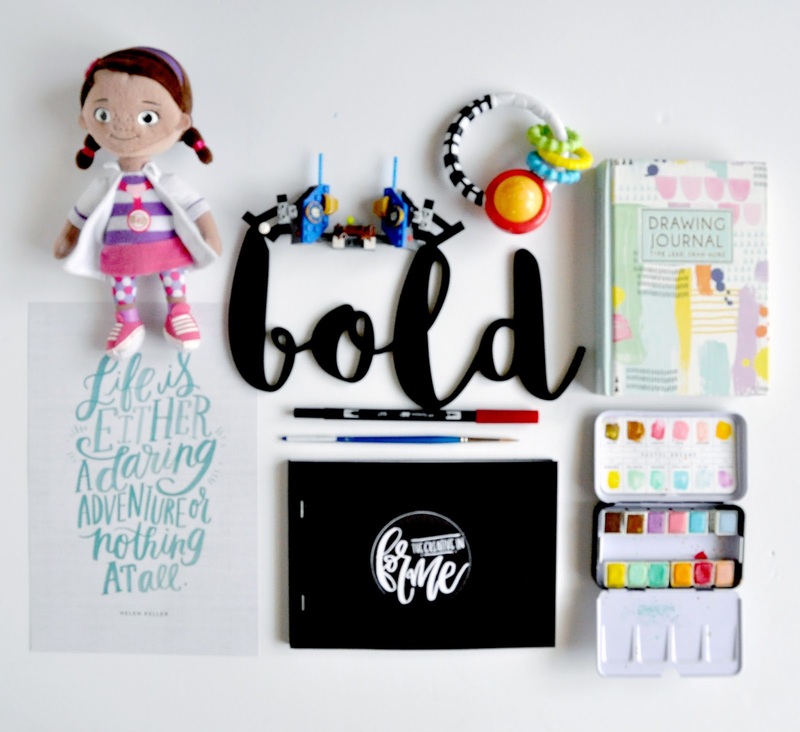 She is a scrapbooker and a blogger based in the US and I have been following her for years now. I absolutely love her work whether it is her photography or her journalling or the products she sells! She's beyond amazing! If you are familiar with my Ramadan Journal, it is actually inspired by Ali's December Daily. Basically, what you do is you pick a word at the start of a new year and live intentionally with that word in mind. Ali says on her website, "these words have each become a part of my life in one way or another. They've been embedded into who I am and into who I'm becoming. They've been what I've needed most (and didn't know I needed). They've helped me to breathe deeper, to see clearer, to navigate challenges, and to grow." I wouldn't say you can start this project only in January. I chose my word for 2017 'bold' in November last year and have been working on it since then. So why am I writing/talking about this now? I had blogged about my word for 2015, fearless, and remember a couple of my readers messaging me saying that they were really inspired by my choice and decided to do the project themselves. If my 'one little word' journey these past few months inspires someone, I am all for it. I also wanted to write about where I am right now with my word so that I can come back and see how the project went at the end of this year. I feel 'project' isn't really the right choice of word, but let's call it that for the time being. So my word for 2017 is Bold. Around October last year, something happened in my work life and I felt knocked down. Unfortunately, I can't share what it was for personal reasons. It sort of put me in a weird and dark place. This was also few months after my youngest was born and I was getting adjusted to this 'mother of three' gig. One might think that having a third child makes us more prepared as we have experience at parenting. It sort of does but having a newborn to take care of is still an experience in itself and no matter how many children we have had before, it is still a major adjustment for parents, for both the mother and the father. So this thing that happened made me feel like wrapping things up, just shutting down my store and be done with it. I thought about it for many days, it was not a spur of the moment thing and the urge to give up was really strong. Around that time, some of the bloggers I follow on Instagram were talking about their one little word for 2017 and I started thinking about mine as well. And I can't remember what it was, but something just clicked, just fell in place. I told myself that I have worked so long and so hard to get my store where it is and I still have a long way to go. This experience that I was going through was just one of the many hurdles I have had to jump over to reach where I want to be and I shouldn't just give up. Now I am a person who gives her all when it comes to doing anything. I don't like doing a haphazard job and whatever project I take on, I give it my 200% best or I just don't do it. This has worked both in my favor and against. So I told myself (back then), you know what, for the past few months I have been slacking a bit at work and it was okay as I had a new baby to take care of. Every mother needs time to get adjusted. But it was time to get back into the swing of things and use this new hurdle as an opportunity to try new things and see how it goes. And so I picked the word 'bold' or rather the word picked me. I know it sounds very dramatic and Bollywood-ish, but it's true, the word really did pick me. I decided to give myself time until December 2017 to take all sorts of risks and make bold choices and see how things work out for Pretty Paper Studio. The first thing I did was get behind my tech team and get the online workshop launched. It was something my friend Ujjwal and I had been working on since January 2016 and was delayed for a number of reasons. I decided to put my foot down and get it launched before the end of the year no matter what. Alhamdulillah, the first online craft workshop in the UAE, Simply Watercolors, was launched on our website - www.ppsuae.com. Then I decided to give our website a bit of a revamp. As much as I loved the previous design, it had become outdated and quite honestly I was bored of it. Alhamdulillah, that was done too. The reason why I am mentioning it here is because it cost me a good chunk of money and it was a bold move considering that I was thinking of shutting my store down. In the meantime, I came up with this idea called For Me DIY Kit where I would work with fellow local makers and small businesses to put a DIY Project Kit for women whose creativity needed a bit of nurturing. Alhamdulillah, the first kit was launched in January, it sold out in March and the second one is on it's way, in sha Allah. I have to correct myself here, the idea of a DIY Kit is not really mine as it has been done before. But, it's the first time in the UAE. I also went with my guts and worked with a few local influencers to spread the word about Pretty Paper Studio. Some of it brought returns, some not so much. I have also been collaborating with local and international teachers to put together offline/in-person workshops. Four of them are done and a couple more to go before Ramadan. Alhamdulillah. There are a few other things that I have completed including the launch of this podcast (yaay) and a few more in the pipeline. Let me keep them private for the time being. So why am I listing all of these here? There is this misconception that an online store doesn't really require a lot of work or investment. This is far from the truth. Any business, online or offline, needs a lot of care. Yes, an online business does give us a certain amount of flexibility but as they say, money does not grow on trees. If we want our business to do well, we have to be ready to work long and hard on it. We cannot let a hurdle or two make us fall down. If we do fall, we have to get up, dust ourselves and continue walking. And that's what I am doing right now. Let's see how far I reach by December. I will keep you posted. In sha Allah. Whether it was for influencer marketing or to work with local makers on the For Me DIY Kit, I had to work/partner with others. Most of the time, we are hesitant to take that first step of asking someone to work with us. For example, sending an email saying - hey, would you like to work with me on so and so project? - seems daunting as we worry what if the other person says no. Yes, we will hear a lot of No's but we will also receive several positive replies. All it takes to ask and ask soon. When we start a business, we are on this adrenaline rush and we are passionately getting things done. As weeks, months and years go by, we tend to see the wear and tear in ourselves and we might have days when we just don't feel like it. But, we have to show up and we have to be persistent with our work to get the results that we want. I saw on Ali's website that she was offering custom OLW cutouts. As in, you can place an order on her website saying what your word is and she will send you a cutout of the word that you can keep. I liked this idea but I decided to get it done through a local maker - The Party. 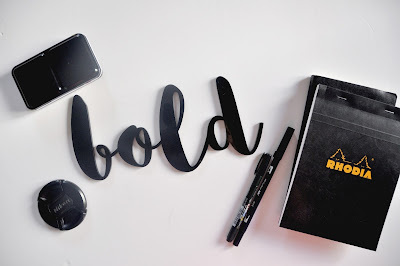 I absolutely love the acrylic word 'bold' that's on my studio wall now and it's a daily reminder of my word, my journey, and my intentions. 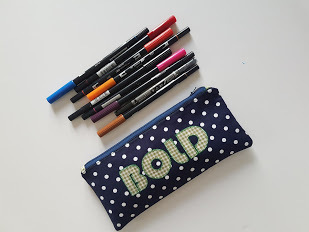 I also got myself a customized pouch made from Quilted Tales to store my brush pens as I am into lettering now. I forgot to mention in the podcast that I am also keeping an album using Project Life supplies. That's all for today. I hope this episode inspires you to take your next step, however, huge or little it may be. And if it does, please do write to me! My handle is @neelusjournal on Facebook, Instagram, Pinterest, and Twitter. Hit the Play button above to listen. Subscribe to Spark On With Neelu on iTunes here. You can download this episode to listen again later, subscribe to my channel to not miss out on future episodes, and you can reach me via sayhi at neelusjournal dot com as well. Alright then, speak soon! Wassalam! 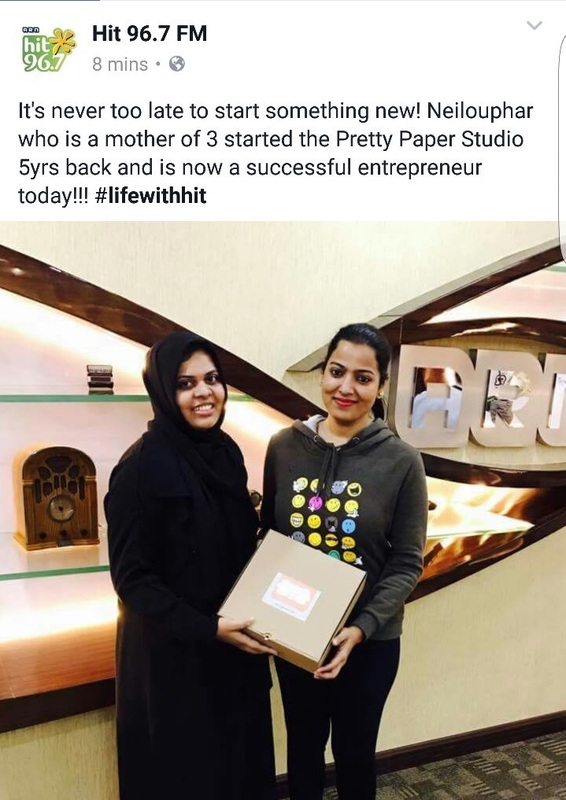 Kudos to you Neelu! I am so glad you did not let what happened to you pull you down, because you truly have achieved remarkable things. You are an inspiration not only in terms of creativity but also for your hard working ethic and grateful soul. I am honoured to know someone like you. I wish you lots more success in sha Allah and hope you go on to achieve many more bold dreams in the future.